Stunning Vacation Rental on the Oceanfront in Carlsbad!!! THERE IS AN OCEAN VIEW FROM EVERY ROOM! There is no carpeting in these units -- just luxurious bamboo and porcelain floors. The units are fully furnished, the kitchens fully equipped. All linens and beach towels are provided. We have beach chairs, umbrellas, Boogie Boards, and sand toys. We also have a surf board and two beach cruisers to share. NO SMOKING and NO PETS PERMITTED anywhere on the premises. Walk 30 seconds to the beach! Walk to restaurants, the charming village shops, the farmers' market and nightlife are all nearby! Once you are here – you will not need a car to explore Carlsbad – walk to everything! Shop at the Carlsbad Outlet Mall or at The Shoppes at Carlsbad. My mother was from Paris, and my father from the States. Have traveled all over the world and would love to share the peace I feel in Carlsbad with others. Carlsbad has long been my vacation destination and I am hoping to share it with others! I want people to love their stay and enjoy Carlsbad as much as I do! I hope you find the time to sit back, relax, and feel the beach lifestyle! Spectacular European Finishes, NO carpeting, bamboo floors, professional appliances, beach supplies, walk to everything, Ocean Views from Every Room! We rented out the entire residence for a week. Everything was well stocked to get you started and the beach gear (bikes, boogie boards, umbrellas, etc.) were great. We’d definitely stay here again! 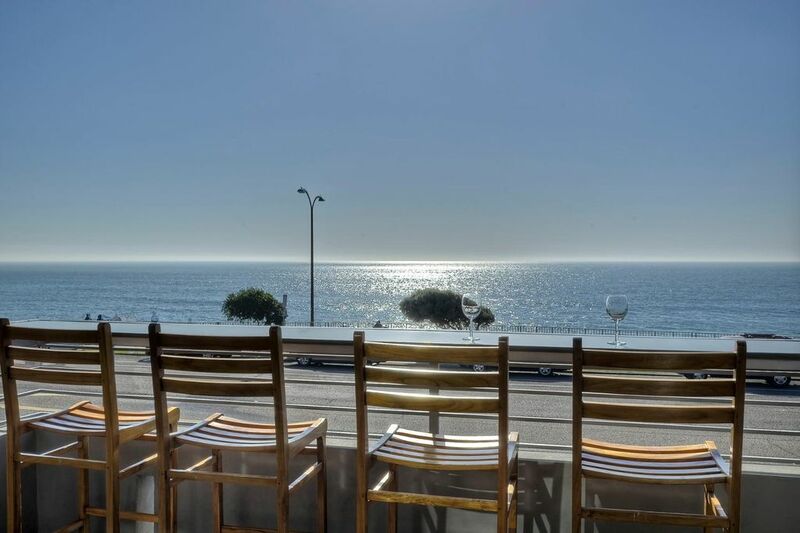 Coffee in the morning and wine at night gazing at the Pacific Ocean from your private deck! We have stayed in many wonderful vacation homes over the years and this one didn’t disappoint! Perfect location, beach access, a stunning view and room enough for our entire family of 10. Six adults and four children. We rented both units but spent most our time in the upstairs unit because of the view, nicely appointed kitchen, where we made dinner every night, plus a comfortable family room. Bedrooms are small but all bedrooms have king size beds which is hard to find and a plus in my book. No one had to fight for the bedroom with the king bed for a change! Garage was stocked with beach chairs, boogey boards, bikes, sand toys and more. We brought our own but didn’t need too. A couple of negatives but nothing that would keep us from recommending this home or stop us from going back, and I hope to do just that! The property managers, especially Jenny who we worked with was available to answer questions or bring us a few more towels when we asked for them and anything else we needed. Jenny was very caring, thoughtful and easy to work with, wanting us to have a good time, which we did. We just got home and unpacked. Already missing Carlsbad! We stayed in the lower 2 bedroom unit for one week starting February 3. Unit is just as pictured and is a very nice option for staying in the area north of San Diego. The furnishings and the bed were very comfortable and all of the appliances in the unit were of excellent quality. The knives were sharp, the coffee maker was a Cuisinart, the laundry machines were top of the line. The kitchen was extremely well furnished and all previous renters have left a wide variety of spices to use. Some coffee was furnished, enough for 2 days and detergents for all appliances (dishwasher and laundry) were included. We were very happy to have chosen the lower unit as the stairs could have been an issue for us 75 year olds. The outside fire pit was very nice and the outdoor furniture was perfect. The location of the unit was perfect in our exploration of the coast, close to everything, much in walking distance. We took the Coaster train to San Diego for the day, a perfect way to visit the city. The only thing we disliked was the traffic on the road in front of the house. We knew the road (4 lane) was there and were prepared for it, but sometimes the noise was bothersome. Nevertheless, we would highly recommend this property. It is a gem. We rented the entire house for 4 nights. My husband and I and our 20 month old son stayed in the Pelican Suite (upstairs) and our friends and their 20 month old daughter stayed in the Dolphin Suite (main floor). The house was amazing! Located right across the street from the beach and walking distance to lots of stores and restaurants, the location was perfect. The house has modern, high end finishes with lots of windows providing great views of the beach, ocean and sunsets. Garage parking, laundry room, use of beach toys, bikes, etc....this place has everything you need for a great family vacation. We would definitely stay here again! My husband and I stayed at the lower Dolphin Suite for 4 nights. It is a very nice property with beach chairs, bicycles, a great laundry room, etc. As mentioned, you can park in the garage. It's great. Parking is tight nearby, so there is no stress about parking. We had a couple of issues. A phone call to Patrick and both issues were resolved the same day. The Dolphin Suite has 2 bedrooms and 1 bathroom. It was perfect for the two of us. It would also work well for a couple with two smaller children. We couldn't have asked for a better location. The crosswalk to the beach access is directly off the patio. It's also close enough to the Village that you are able to walk to restaurants, shops, etc. We had little need for our car. The Dolphin Suite was perfect for our family. It was very modern and updated, well-equipped, and very comfortable. The bedrooms were good sized. Even with the main road right outside the door, it was not too loud during the day with the doors closed and wasn't loud at night at all...something we seek out with our small kids going to bed pretty early. The laundry facilities were very handy and were equipped with detergent. My only caution with the Dolphin Suite was that you can hear every step the people staying upstairs are taking. We had a family of 3 staying upstairs during our visit, so not many people, and it was still very noticeable. Even so, I would still highly recommend this property! One item to note, the cleaning fee is to be paid upon check-out, not upfront. Be sure you have cash on hand for this. Watch the sunset over the Pacific from every room! Watch the dolphins, pelicans, and waves! Fall, Winter, Spring Pelican = $250/night Dolphin = $180 night/ 4 Night Minimum. All Prices+ Tax(10% +$1/day),$100 Per Suite Cleaning Fee & $500Refundable Sec.Dep.